We check in one last time with the great 2006 mead experiment and talk a bit about small batches. We also sample an all grain small batch IPA. Kevin DeLange of Dry Dock Brewing Company gives us a tour of his award-winning brewery in Aurora, Colorado. Steve and James brew up a six-pack's worth of Robust Porter and talk about ten useful gadgets for home Brewing. We're invited to a group brew celebrating Teach a Friend to Homebrew Day, and we're treated to a tour of a cool homebrew system by Mark Smith, the event's host. Steve spends a day in the kitchen using five homebrews as ingredients in a traditional holiday meal. James and Steve pair the wonderful dishes with an oyster stout brewed by a viewer and a spiced ale brewed by James. Homebrewing guru Charlie Papazian shows us around his home brewery. 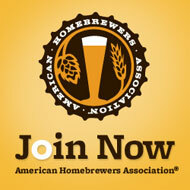 Then, we sit down to sip a couple of homebrews and chat about homebrewing and beer in general. We travel to Denver to sample the goodness of the 25th Great American Beer Festival. Almost 400 brewers, more than 1,600 beers, and three happy podcasters. It's a sweet episode. James and Steve check in on the mead experiment. Steve also talks about Brewing beer with honey, and the guys sample a couple of examples. James and Steve sample a Harvest Ale made from Cascade hops grown in James' yard, and the guys talk about Brewing with fresh hops right off the bine. August 7, 2006 - Beer for Dessert! Beer's not just for breakfast anymore. Following Randy Mosher's advice, James and Steve pair up four beers with the sweet stuff, and Steve shows us his take on a New Orleans favorite. Home brewers take center stage in Orlando at the National Homebrewers Conference Club Night. Follow James and Steve as they sample great homebrews and meet the wonderful folks who brewed them. It's the first installment from our two-part report from the National Homebrewers Conference in Orlando, Florida. In this episode, James and Steve talk to homebrewers as they sample the work of professional brewers. James and Steve ignore maternal advice and play with their hops! The guys conduct an experiment in late hopping a very small batch to see how the bitterness, flavor and aroma are affected. They also briefly pop the top on the ancho chili mead to see how it's coming along. The great Mead Experiment continues as James and Steve split their mead into smaller batches and use ancho chilis, blood oranges, black cherry, allspice, apricots, and saffron to add great flavor and color. They also sample a bit of the plain mead. *BONUS* Check out the outtakes from the Stepping into All Grain DVD. May 16, 2006 - American Brown Ale and Gumbo Ya-Ya! James brews up an American Brown Ale, using a recipe from Jeff Bearer of Craft Beer Radio. Steve cooks up a rich, New Orleans-inspired gumbo to pair with the brew, using some of the brown ale as an ingredient. The great Mead Experiment begins! James and Steve break away from beer in this episode to start exploring mead. This ancient honey wine is great in a simple form or when flavored with fruits, grains, or other wonderful things. James pops the top on the six-pack IPA, and Steve prepares a shrimp and scallop dish to go along with it. James and Steve bottle their six-pack IPA experiment and decide a bet from the guys at Big Foamy Head. James Spencer flies solo in this first stand-alone Basic Brewing Video episode. James dry hops the six-pack IPA. Steve Wilkes joins James Spencer as they brew a little beer - literally. The guys brew up three quarts of IPA as a fun experiment.